The Boston Celtics are good. They’re really good. Nobody talks about the Celtics like nobody talks about brunch. Brunch is rarely had or brought up but you mention brunch to someone and they get more excited than Tom Brady scoring a touchdown. Brunch, like the Celtics, is very versatile. Celtics can cover you like maple syrup on a stack of pancakes. Or, they can bring it to the rack right in your grill like a juicy cheeseburger. The Celtics are currently 39-27, 12 games over .500. That’s good for second in the division trailing only the Toronto Raptors, who have really come on this year and even though people think they’re going to go away, they simply haven’t. The Celtics are also the #3 seed at the moment and if the season ended today they would face the tough Atlanta Hawks in the first round. The C’s have won 8 out of the last 10 games with one of those losses coming against Cleveland on the second night of a back to back and the other loss was only by four points against the Rockets. They’re well coached, they’re a tight knit team that loves playing for head coach Brad Stevens and each other. They’re so exciting to watch and they play like wild dogs on defense, frustrating opponents causing them to make mistakes and get them off their game. 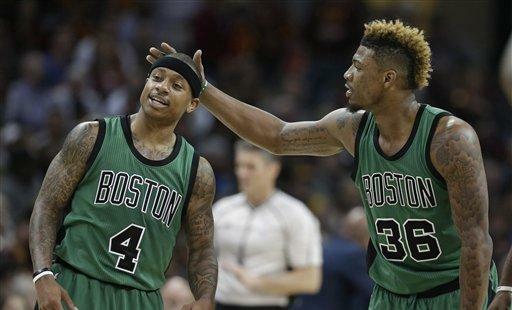 Nobody knows what seed the Celtics will finish at and nobody knows how far they can go. It’s exciting and completely unpredictable! The Celtics could get bounced in the first round or they could make it to the Finals. They play “playoff type defense” already and they just need to keep executing on the offensive end consistently and if they can get 100 points per game then I absolutely love their chances. There’s a whole buffet of potential and it’s appetizing. I need to go grab some french toast and curly fries. Next How Will The Celtics Replace Jae Crowder?